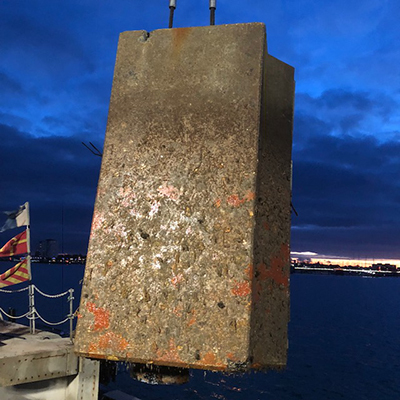 APA Concrete Repairs Ltd has recently undertaken structural refurbishment works on Victory Jetty of Her Majesty's Naval Base (HMNB) Portsmouth, in order to create a second operational birth, to ensure the Jetty can accommodate the docking of both of Her Majesty's Ship's (HMS) Aircraft Carriers (HMS Queen Elizabeth & Prince of Wales). 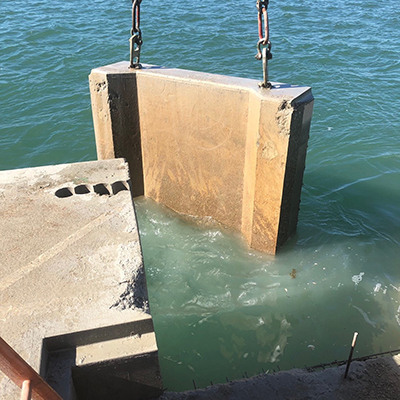 The complex nature of the project called for an extensive design phase to first be carried out, in order to accurately formulate the process of dismantling sections of the jetty without affecting the integrity of the structure. 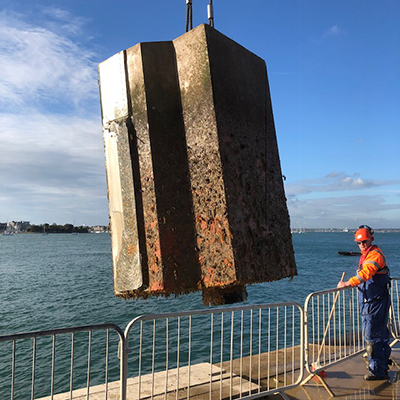 The works undertaken involved the cutting and removal of significantly large sections of concrete from the jetty, carried out through the use of a new underwater wire saw, uniquely designed and built by APA, specifically for the purpose of this project. 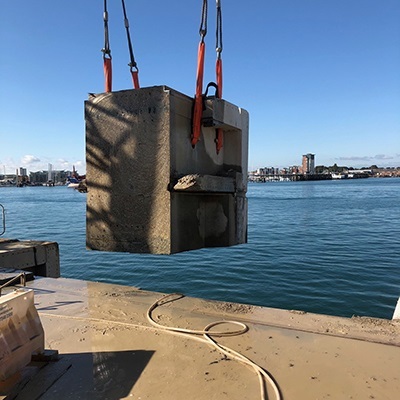 A specialist diving team was utilised throughout the works; deployed underwater to attach the wire saw to specified sections of concrete, before being subsequently lifted out of the water and onto the deck, where they were later crushed and recycled. This structural refurbishment programme has confirmed the future of the Portsmouth Naval Base for the next 50 to 80 years, ensuring it is now the only port where both the HMS Queen Elizabeth & Prince of Wales can birth simultaneously. Take a look below at some of the blocks of concrete that were removed! Click here to view the full project profile.